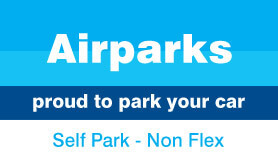 New product at BHX airport - park your car yourself in our best-selling car park. All the usual great Airparks features, including superior security, timely transfers and friendly staff - and you keep your keys too, so you can make a snappy exit when you come back. Book this month for your chance to jet off like a superstar - click 'more info' for details. NEW PRODUCT. Park the car yourself and keep your keys! Park Mark award for highest security. New product, Park the car yourself and keep your keys! CCTV and 24 hour security patrols. All Airparks buses have disabled access. Because this is a special low price, you can't make any changes to your booking, or cancel and get a refund. Bikes, surfboards, canoes and other large objects that won't fit into the luggage racks can't be carried on Airparks buses. If you are bringing large items with you, we suggest you drop them off at the airport before you park your car. If you come back to a flat battery, Airparks will be happy to jump start your car for you. Airparks Birmingham has ladies', men's and disabled toilets, and you can buy hot drinks from the vending machine in reception. We recommend that you give yourself 45 minutes to drop your car off and transfer to the airport - longer in rush hour, or if there is a major exhibition at the NEC - you can check on www.necgroup.co.uk. If you're delayed picking your car up, you'll need to pay for the extra parking at the car park's normal rate (which is more expensive than the price you pay when you book with us). If you pick your car up early, unfortunately we can't give you a refund. If you're going to come back early, please let Airparks know, if you can. Park in one of the Self Park arrivals bays and head to reception to check in. You'll need to present a copy of your booking confirmation and you'll be given a ticket, which you should keep safe as you'll need it later. Park your car where you are asked and then catch the bus from the waiting area to the airport. You'll need to show your ticket to the driver. Just catch the shuttle bus back to the car park from bus stop A - the same place that you were dropped off at. You'll need to show the ticket you were given at check-in to the driver. After you've collected your car, scan your ticket at the exit barrier to exit the site. Follow the A45 for Birmingham past the Holiday Inn hotel on the right hand side and through the set of traffic lights. At the third set of traffic lights, get into the right hand lane and follow the signs for Garretts Green. This will be signposted off-site airport parking site. Take the right hand turn (sheaf Lane) heading for Garretts Green and Marston Green. Follow this road until you reach a roundabout. Turn right at the roundabout, signposted for off-site parking (airport) site A. After half a mile turn left onto Mackadown Lane. Airparks is on the left just before the railway bridge. Take the A45 for Coventry. At Wells Green traffic lights take the left hand turn (Sheaf Lane) heading for Garrets Green. Follow this road until you reach a roundabout. Turn right at this roundabout, signposted for off-site parking (airport) site A.